I bought them whilst browsing my local ‘Sur La Table’ store, and have been stocking up ever since! NICE…. 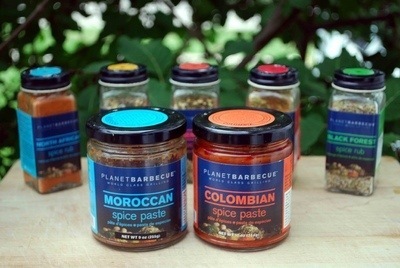 I’ve never heard of a spice ‘paste’ but I am guessing it would stay on the meat longer/better. We can also highly recommend the Tom Douglas “Rub with Love” collection… YUMMY stuff! I love the Tom Douglas rubs! They’re hard to find here, but I usually buy them on Amazon. Especially love his salmon rub. So tasty! Ik wist niet dat Omoe mosterd maakte?! Ik heb dat 30jaar geleden ook nog gemaakt,maar heb het recept niet meer.